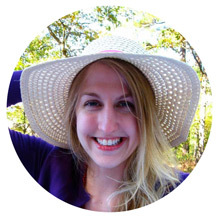 I love how the vibrant online community of food blogs has erupted into autumnal flavors. A flickering fireplace on a chilly day has nothing on the cinnamon-and-spice glow of recipes flickering across my computer screen. The latter keeps not my toes but my tastebuds warm and cozy. Okay, okay, I’ll admit we haven’t had much need of it lately in Charlotte. The South still can’t make up its mind about the season, so temperatures have been in the 80s the past few days! Sorry to those in New England who are grumbling a bit right now. Soon enough, the chill will settle into North Carolina. In the meantime, I’ll enjoy fall flavors without the appropriate meteorological accoutrement. My friend Katie and I had a date to bake together last weekend, and I was thrilled to hear that she was craving pumpkin just like I was. You may have heard about the pumpkin shortage, but thankfully I’d stocked up on a few cans of pumpkin before even hearing about it! 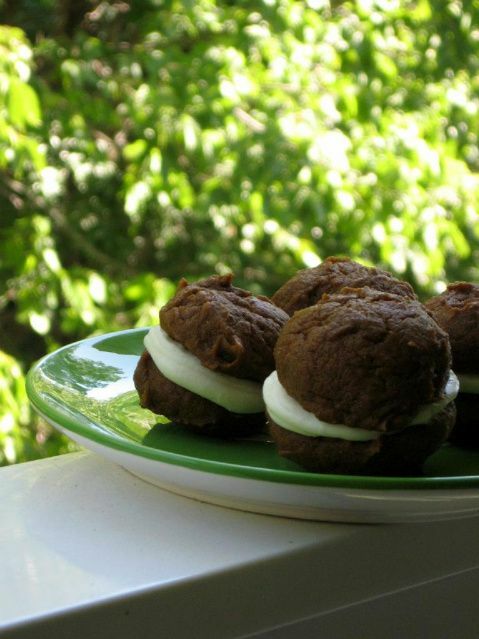 So Katie and I brainstormed via email and decided to use our scarce squash to bake these gorgeous pumpkin whoopie pies. 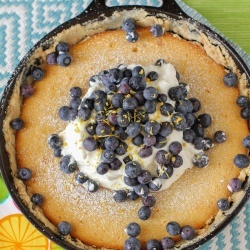 The recipe is from Matt Lewis of Baked bakery in New York City. 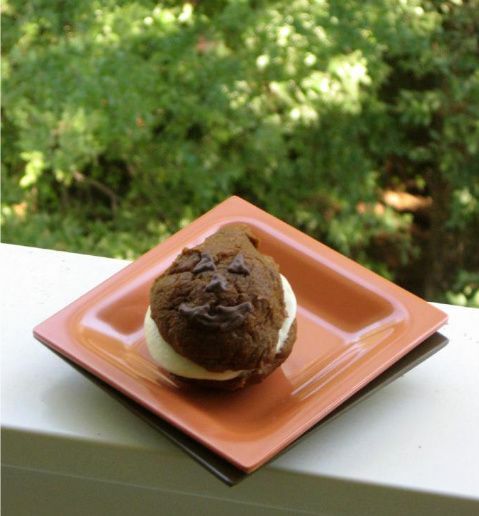 I’m a huge whoopie pie fan. My mom makes traditional whoopie pies each Thanksgiving and the rich, cakey chocolate and cream combination is something I look forward to all year. Imagine that same extremely moist, cakey texture with a beautiful pumpkin spice flavor instead: rich, dark brown sugar; ginger; ground cloves; and cinnamon. The result is a darker than average, plump pie that when slathered with sweet cream cheese spread, is the perfect fall bite. This is also the perfect recipe for cooking in partners. Katie measured out dry ingredients while I whisked pumpkin and sugars together. We found that she (with previous ice cream shop experience) was an expert cookie scooper — wonderful, especially since I quickly realized I was lousy at it! Katie showing off her scooping skills. After seeing Bakerella’s cute twist on her pumpkin pie bites (Jack-o’-lantern faces drawn on in chocolate), I knew I wanted to try faces on our whoopie pies. Katie piped cream cheese filling into each sandwich while I melted up some Candiquik (any chocolate candy melt will do) and set to work. When finished, the faces were adorable — but a little hard to see against the dark whoopie pies! Perhaps using light brown sugar in the pies would make the faces stand out more, but then you’d lose a bit of that great molasses flavor. Use your personal tastebuds and aesthetic to decide! Katie doing some fantastic filling. One thing I didn’t anticipate was how good chocolate and pumpkin taste together! Y’all already knew this, didn’t you?! Why didn’t anyone tell me?! The richness of the milk chocolate was a perfect partner to the spicy pumpkin flavor, and I’ve even been inspired to search for more recipes that use this combination. Give it a try if you haven’t already! 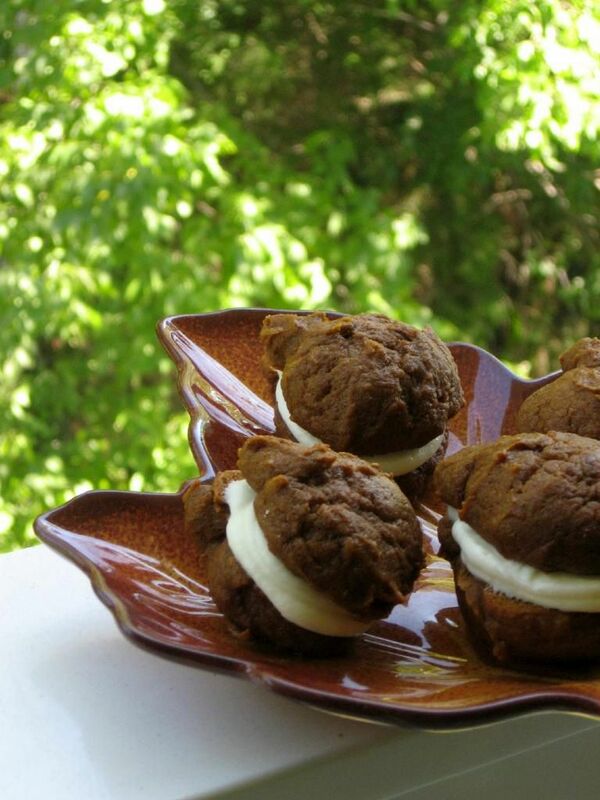 There are so many satisfying facets of these whoopie pies: the simple recipe, the deep and indulgent fall taste, the cute Jack-o’-lantern grins. The most satisfying part, though, was definitely the time spent baking with a friend. I hope you’ll invite a friend over (or maybe just invite a husband, wife, son, or daughter into the kitchen) to help you make some of these sweet pun’kins! 5. 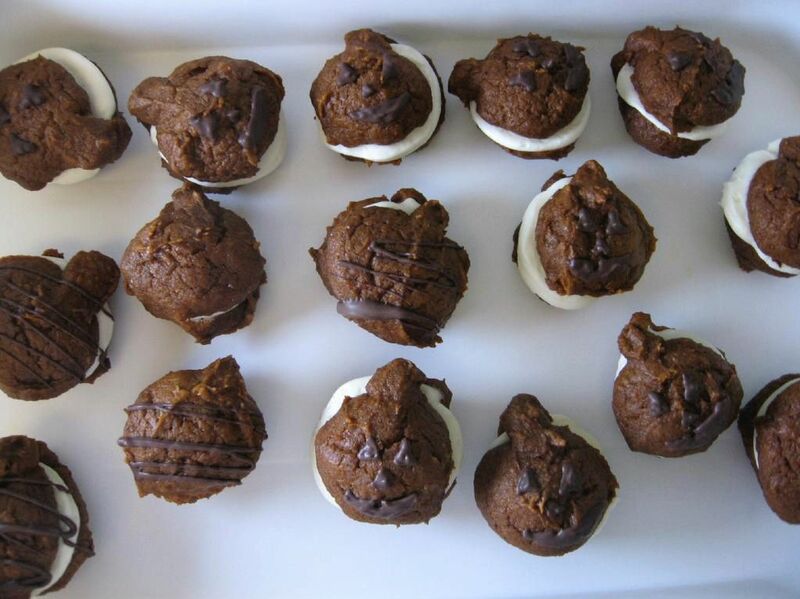 Assemble the whoopie pies: Line a baking sheet with parchment paper and set aside. Transfer filling to a disposable pastry bag and snip the end. 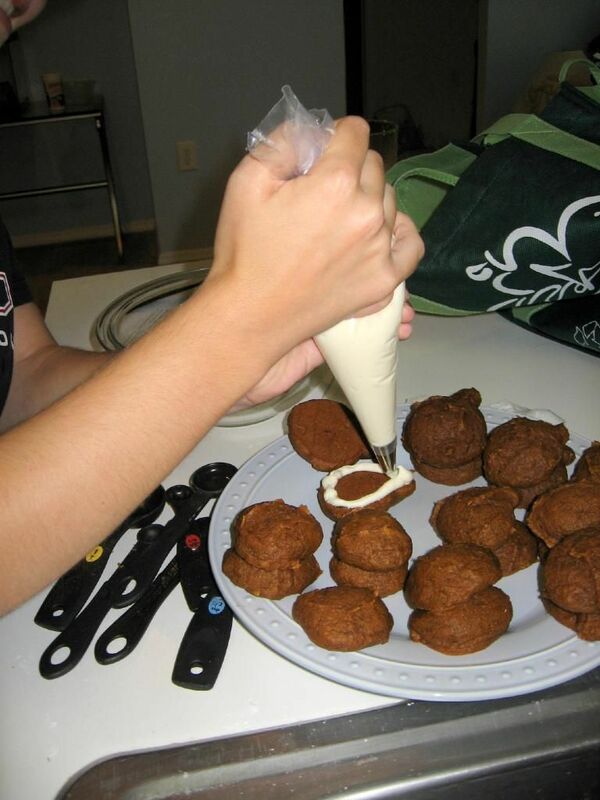 When cookies have cooled completely, pipe a large dollop of filling on the flat side of half of the cookies. Sandwich with remaining cookies, pressing down slightly so that the filling spreads to the edge of the cookies. Use a ziplock bag with a tiny corner cut off to pipe on melted chocolate in the shape of Jack-o’-Lantern faces. Allow these to harden (stick them in the fridge for a bit to speed it up). Transfer sandwiched and decorated cookies to a prepared baking sheet and cover with plastic wrap. Refrigerate cookies at least 30 minutes before serving and up to 3 days. 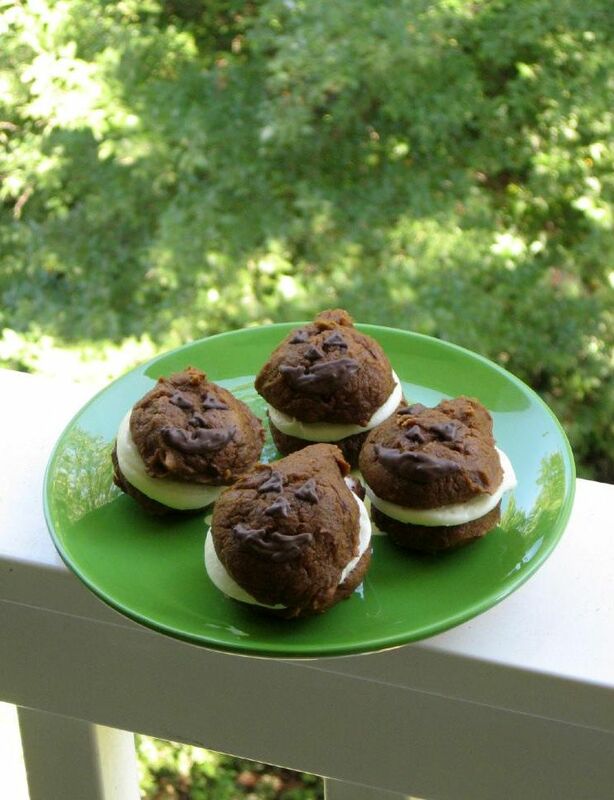 NOTE: There’s a lovely video of Matt Lewis making these whoopie pies located here (click on “Watch Video.”) Though the recipe above seems to have a lot of spice, it’s really the perfect balance — don’t skimp. These are so cute and they sound delicious! 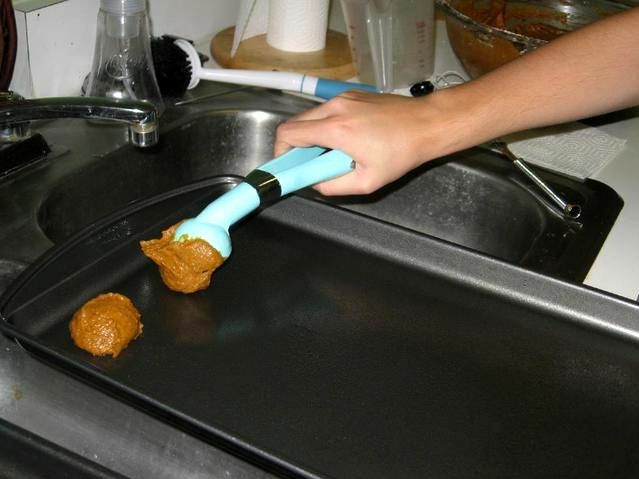 I just got some fresh pumpkin puree from a friend and I was trying to decide what to make with it–now I know! 🙂 Thanks for posting. Hurrah for fresh pumpkin puree! Hope you love them, Jill! Let me know what you think. I have had pumpkin with chocolate chips, but not a chocolate batter. It sounds wonderful! I like pumpkin, I like chocolate, but why anyone would ever eat those two wonderful flavors in combination is way beyond my understanding. I don’t like strawberries dipped in chocolate, either, and lots of people love those. It just makes me cringe! Baking with friends is the best, isn’t it? I was smiling the entire time I read your post! I loved baking with a friend, too. Such a nice time to talk — and great results! Thanks, Kat! These look so cute and yummy!! Thanks for sharing!! Too funny! 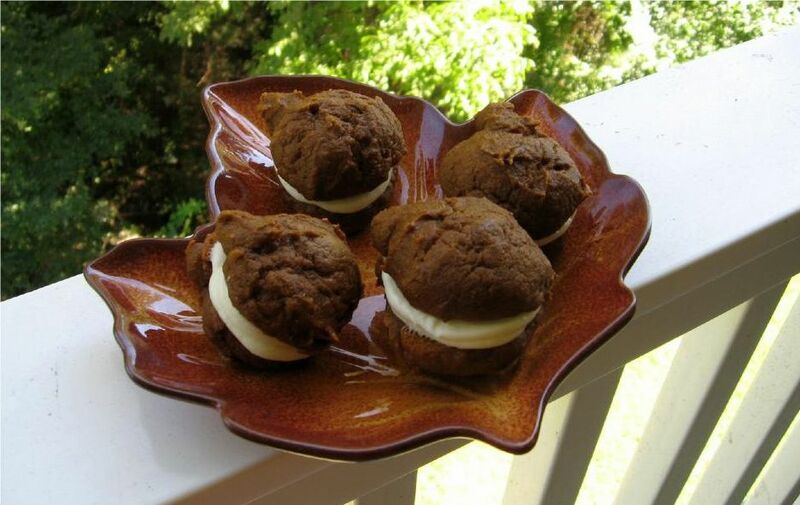 I am making pumpkin whoopie pies very soon – they’re one of the reasons I stocked up on pumpkins. I love the little faces on yours! And yes, chocolate + pumpkin = wonderful!! These look fantastic. I wish I could get pumpkin puree when I am. Can I use any type of sqaush, would a butter nut squash be suitable to make the pumpkin puree? I think so! Try butternut squash or sweet potato puree!